STAR TRACE's Industrial Magnetic Head Pulleys provide effective way to remove ferrous contaminant from powdery, schistose and granulate material, like ore, coal, waste, sand and etc. Industrial Magnetic head Pulleys are composed of 360 degree magnetic core protected by rotatable stainless steel cover and a axis of rotation. In practice, surface of Pulley will be wrapped by belt, so as material flow over it. Ferrous contaminant will be attracted at belt and be conveyed out of material. In many applications, it's possible to replace an existing head pulley with a permanent magnetic head pulley, on a size-for- size basis. A wide range of diameters, widths, and shaft sizes are available. STAR TRACE Industrial Magnetic head pulleys are built using our exclusive flux control magnetic circuit. This design ensures continuous magnetism around the entire circumference of the pulley-no dead spots. For less critical applications, a conventional magnetic circuit design is also offered. 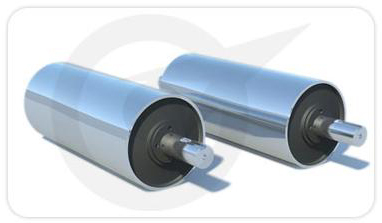 The Industrial Magnetic head pulleys can be installed easily at conveyor discharge. They give complete magnetic protection over the entire face of the pulleys for removing ferrous contaminants. Optimal conditions for magnetic separation are created due to the minimized distance between material and seperator's effective surface. Industrial Magnetic head Pulleys come in different sizes, various diameters and widths are available on request. Shaft dimensions are to customer specifications.